Super Simple Sequin Mask: A few LED sequins and battery pack, no programming or microcontroller required! Just a little soldering and glueing will get you illuminated accents in under an hour. 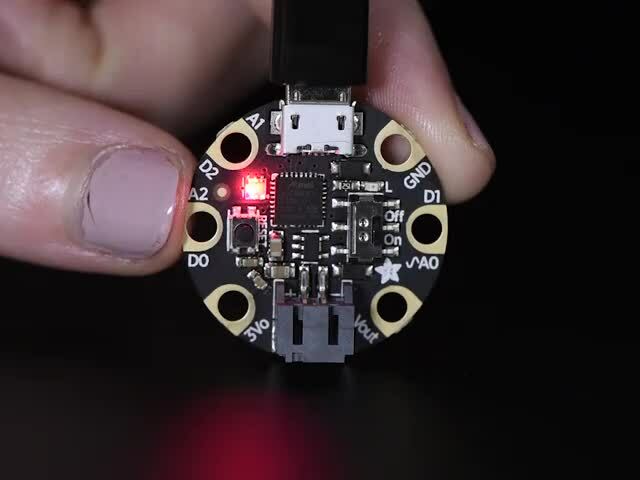 We’ll provide sample code for either CircuitPython or Arduino…use whichever you’re more comfortable with! Sequins come in sheets of five. If they'll be close together in your design, consider leaving them attached to the sheet as you solder them, since they'll stay put more readily-- you can detach and discard the connecting piece before they go into your mask. Strip and tin pieces of wire before soldering them them, two at a time in some cases, to your LED sequins. When you get to the end of the chain, repeat with the battery wires, with the red wire connected to the + side of the sequins and the black wire connected to the - (as shown in the circuit diagram). Heat up your glue gun or find your Quick Hold and glue your sequins into the feather accent. 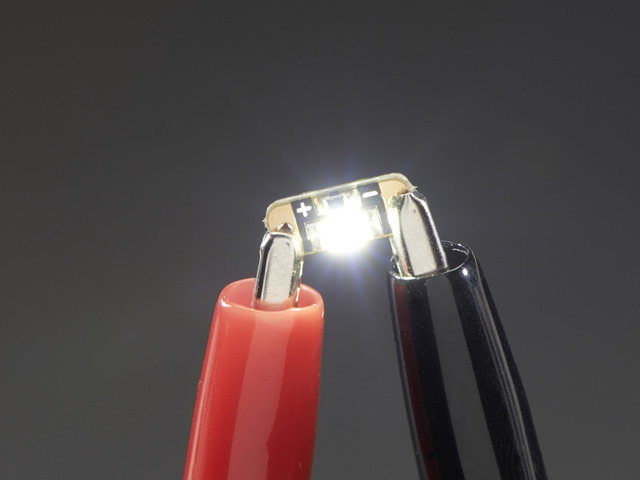 You can glue the circuit to the outside, or tuck the wires behind the first layer of lace. 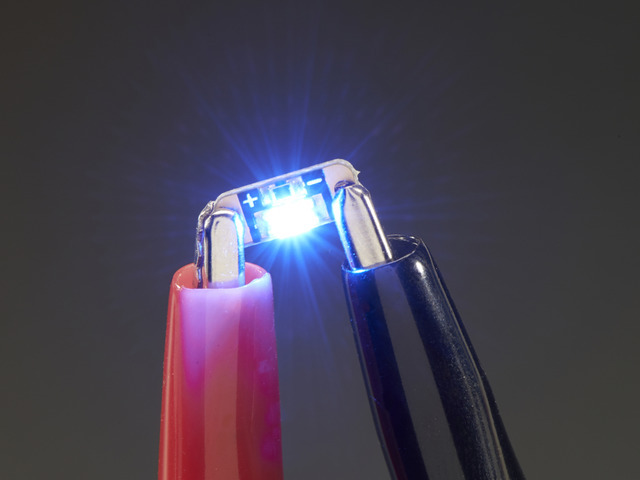 Power up your battery pack to double check that nothing is blocking the LEDs. Finally, find a spot for your battery holder. This may be glued inside the forehead of the mask, or in this case, we sandwiched it in between the feather accent and the mask itself using E6000 adhesive (hot glue won't hold here for long). Set it up to dry where it won't slide apart (we balanced our mask on a paper cup), and let it dry for 24 hours. Use sewing pins to arrange and mock up your design on your mask. Use the circuit diagram below, adding or subtracting NeoPixels to suit your own design. 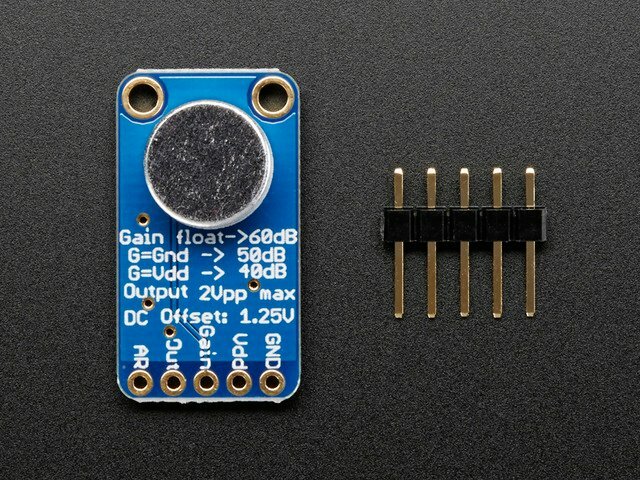 To ensure you have enough wire slack between pixels for your design, it can be helpful to first solder the data connections, then add the power and ground connections with the circuit in its rough orientation. Don't forget that the power and ground connections need two wires connected at a time, which is easier to do at once instead of separately! 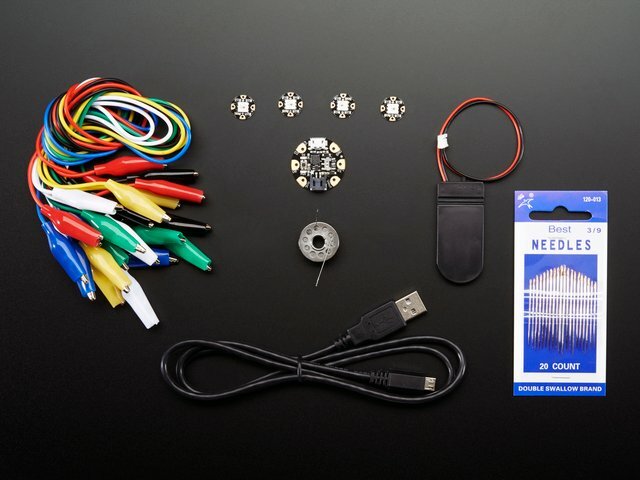 Once soldered, plug in your GEMMA to your computer over USB and program it up with the following sample code or any NeoPixel designs you like! Remember that GEMMA's power switch must be in the ON position! // if you must, connect GND first. Below is CircuitPython code that works similarly to the Arduino sketch shown above. To use this, plug the GEMMA M0 into USB…it should show up on your computer as a small flash drive…then edit the file “main.py” with your text editor of choice. Select and copy the code below and paste it into that file, entirely replacing its contents (don’t mix it in with lingering bits of old code). When you save the file, the code should start running almost immediately (if not, see notes at the bottom of this page). 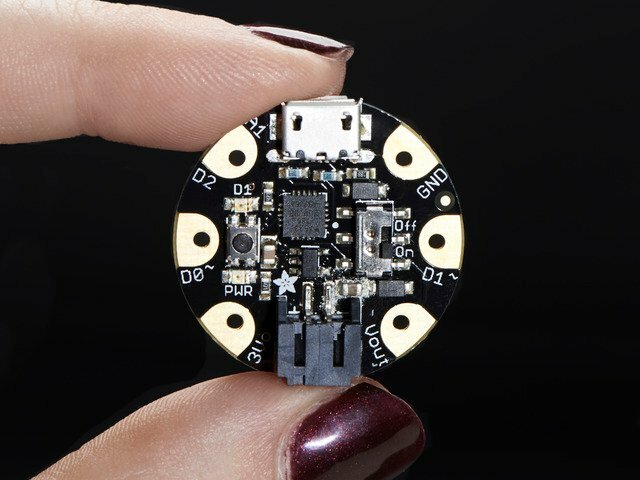 If GEMMA M0 doesn’t show up as a drive, follow the Introducing GEMMA M0 guide link above to prepare the board for CircuitPython. Once you've verified your circuit works, glue it up to your mask and route the GEMMA wires around to the back. Use more glue or foam/velcro tape to put GEMMA in place. Velcro tape is best for securing the battery, so that you can remove it for charging (GEMMA does not have onboard lipoly charging for your safety). Use clear or color-coordinging thread to tack the wires to the mask for a clean finish. 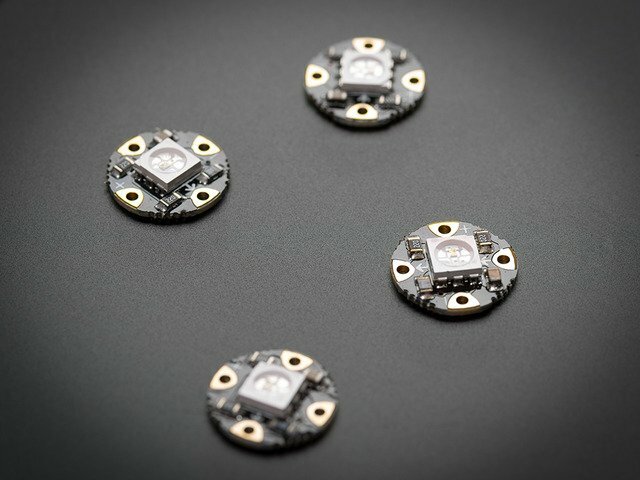 You can optionally use 3D printed diffusers to deck out your NeoPixels even further! Browse our Thingiverse page for multiple available designs. Learn more in our NinjaFlex guide. You can run the wires over the front of the mask, like on the previous page, or you can run the wires on the back of the mask by punching or drilling holes for the wires to pass through. Remove the pinned sequins and drill two holes that match up with the hole spacing on the sequins. 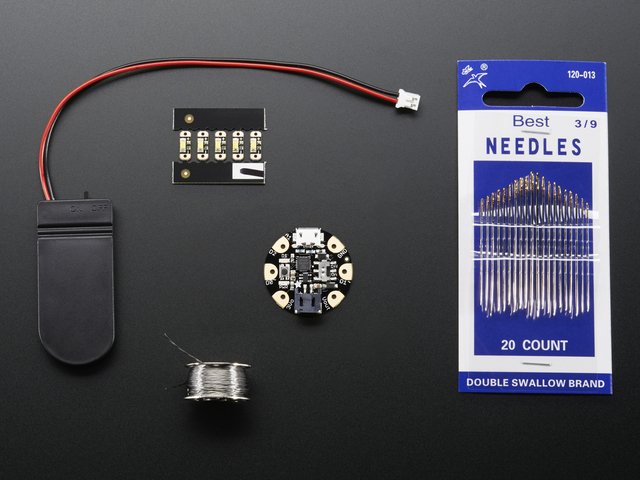 Prep your microphone by tinning and soldering wires to the Vdd, GND, and outout pins. Once both positive and negative sides are soldered, pull the wires from the back so the sequin sits flush, then clip the leads with flush snips. Find a place to put the microphone, which will be different on every mask. We found ajn opening in the fabric lace near the forehead that worked perfectly, but you could put it on the inside facing the wearer's mouth, or anywhere you like. Solder the sequins and microphone up to GEMMA according to the circuit diagram. Install a battery using velcro tape. Plug in GEMMA to your computer with a USB cable and make sure GEMMA's power switch is set to the ON position. // Sound level sketch for Adafruit microphone amplifier. // For the GEMMA sequin masquerade mask. This code requires version 2.1 or later of CircuitPython. Earlier versions didn’t yet support PWM output. The “Introducing Gemma M0” guide explains how to load or update CircuitPython if needed. Now talk or play music for your mask, and see the LEDs change brightness with the volume! Enjoy your costume masks! These are fun to make in groups and are sure to be a hit at Mardi Gras or Halloween. Treat your mask with care and don't wear it in the rain! This guide was first published on Sep 23, 2015. It was last updated on Sep 23, 2015.